LatvianOrnithology Society (LOS), developed in the framework of LIFE EBP Action A10, a local communication campaign to promote participation and better data collection. 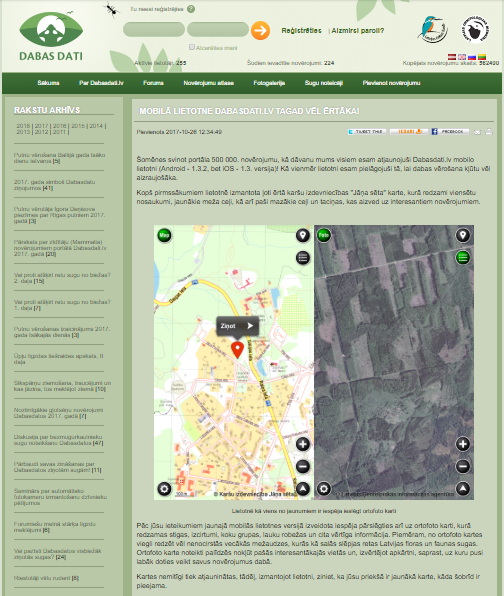 Observers were particularly encouraged to collect complete lists, explaining the relevance of this kind of data and hightlighting that, thanks to the improvements in the Davas dati app, now submitting complete lists was easier than ever. See, for example the articles that appeared in Dabasdati.lv on October 2017 and the detailed information provided also here. Encouragement to use the option of complete lists was also published in the magazine of the Latvian Ornithological Society (LOS) “Putni dabā” and in the methodology of the EBBA project in Latvia. Moreover, the importance of submiting this complete lists was also presented to the participants of the annual meeting of LOS members. There were 2,027 full lists reported during 2017 (287 using mobile application and 1,740 through the web), containing 48,555 observations (8,267 as mobile uploads and 40,288 through the web). It is planned to publish a new appeal in Dabasdati.lv in a few weeks to further remind about the importance of collecting complete lists.